After a (longer than intended) hiatus, I'm back at the whole blogging thing. A lot has change in this time away and I'm writing this 409 miles away from where I wrote my last post. My husband got a well deserved promotion with his company and we now live in a town just outside of Newcastle. Whilst we've been getting settled in and exploring our new surroundings, I've been making a few 'new' bits for the house, to make it feel more homely. We've brought all our stuff from our old place, but I fancied 'sprucing' things up a little and thought it was about time to put some of my fabric collection to good use...seeing as I'd insisted on keeping it for the move (even though some of it had been in storage for many...many years). Although this is not strictly a DIY for home furnishings, I've written a little detail for each in case you'd like to know how to achieve something similar. The snowflake looking fabric to the left and right was fabric given to me by my Mum, which I believe was my Grandmother's before that. I love the colours and print of this fabric, and actually chose to use the reverse side to have on the outside. 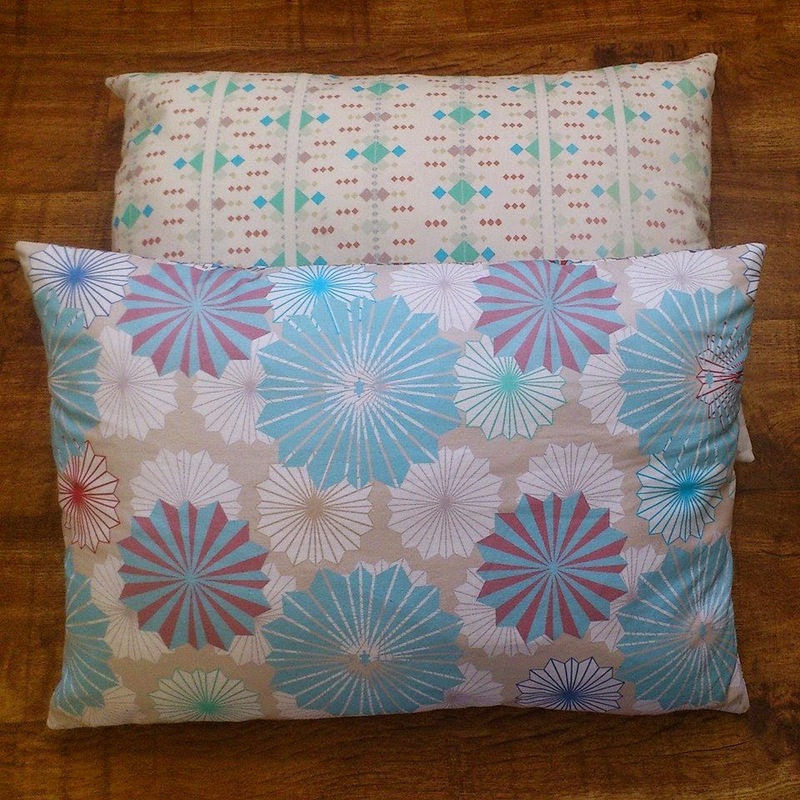 The buttoned cushion in the middle was also made from a John Lewis fabric remnant which was 90p. The front cushion was made from a 30p fabric remnant and vintage lace and ribbon. I simply added neat little pin tucks to the front of the cushion using my sewing machine then further embellished with the lace and ribbon. 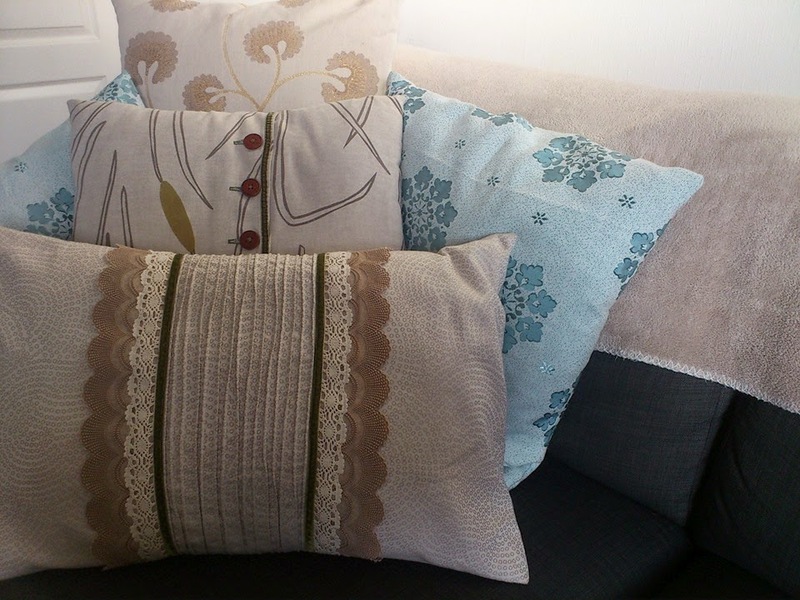 There are actually only 2 of these cushions but the photo shows the designs on either side. I designed and digitally printed the fabric for these cushions a long time ago and my good intentions of making cushions of it was only met a few months ago. 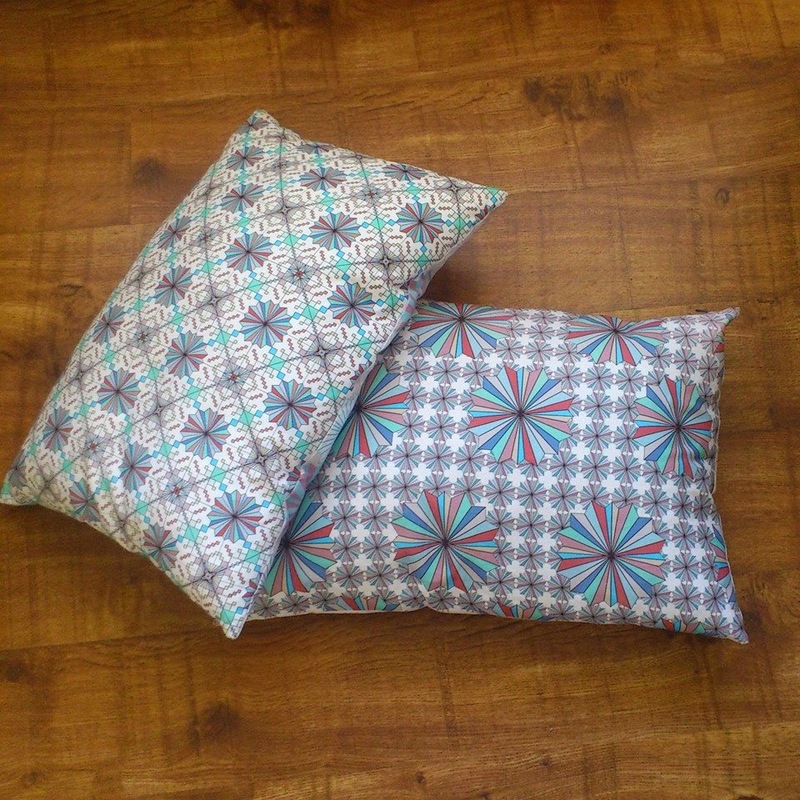 Each cushion has 2 designs which were based on photographs of our Honeymoon in Morocco. Tiles and delicately and intricately carved doors were the basis for the deigns. This is a little Ironic as the fabric is actually from Indonesia, but I think they work well together. This fabric was brought back from Java, Indonesia back in 2009 and was left in the pile with the others as I found the 'perfect' use for it. The fabric is made using the traditional craft of Batik. The pattern and tutorial for the pouf can be found here . I adapted it slightly as I didn't have any fabric to use as a lining, so I simply reinforced the fabric using Fusible Interfacing. I found that this worked really well and also helped to give the pouf shape, as is slightly rigid. Instead of having the stitching visible, I simply hand-sewed the top and bottom hexagons in place. 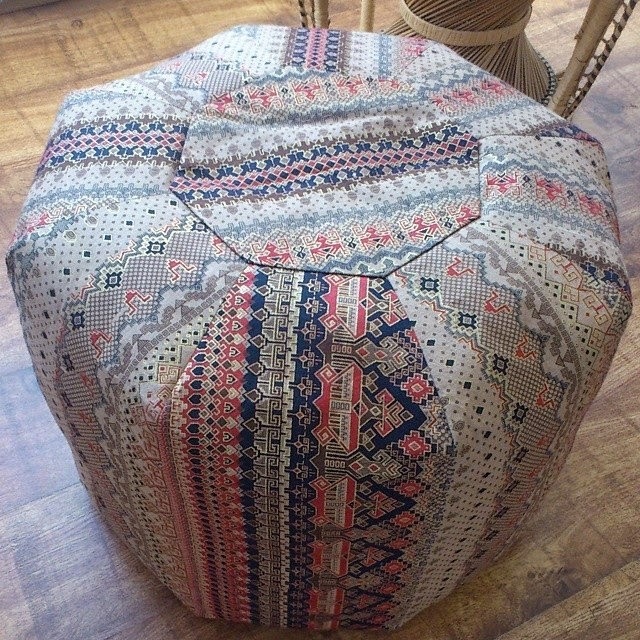 I used the stuffing from old cushion pads and fabric scraps to fill the Pouf. It was a bit of a labour of love but I think it was totally worth the effort. 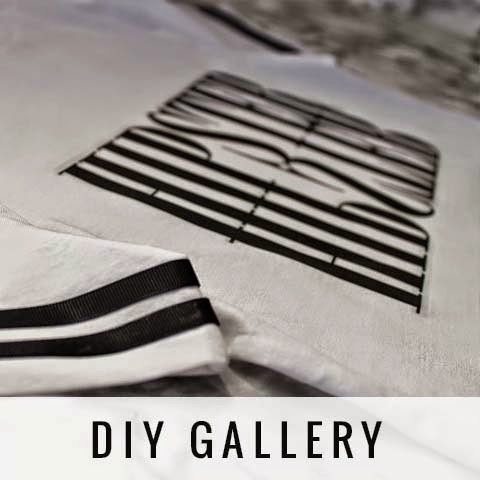 I'm currently working on some new DIY projects which will be up soon....so don't stay away too long!